Sometimes buyers want to back out of their offers on homes. Rescission is an equitable remedy that abrogates a contract altogether. Either a contract is valid, or it is void. In general, contracts may be rescinded due to fraud, mutual mistake, lack of capacity, duress, undue influence, and other reasons. Sometimes a contract may be rescinded due to a unilateral mistake, but this is a difficult situation for which it may be necessary to get the courts involved. A rescission notice is the form that you should sign if you are trying to get out of a deal. Your agent can submit the form to the listing agent to notify the seller or lender. At Pulgini & Norton, our Boston real estate attorneys can help buyers issue a rescission notice or advise sellers of their options should they receive a rescission notice. Rescinding a real estate contract or loan agreement means that you have gotten out of a deal so that you are in the same place where you were before you signed the contract. It is distinct from breaching a contract, which means that you did not perform on a contract that was in place. Buyers sometimes wish to rescind a loan agreement or purchase contract because they did not understand the contract terms or because they felt rushed to sign a contract with the seller or make an offer, and then they changed their minds. The Truth in Lending Act (TILA) provides buyers with a period within which to get out of a loan if they wish. For example, if you refinance your home and then find a better deal or decide that you do not want to refinance after all, you may send a rescission notice. However, you may rescind loan contracts only if they are with a lender other than the one with which you currently have a mortgage, rather than a loan contract that was used to buy your home or a second home or investment property. The lender is supposed to provide you with a notice advising you of your right to rescind, including the procedure that the lender uses for a rescission. If not, you need to make sure that you make your intention clear by submitting a written rescission notice. You will be obliged to prove that notice was provided within the right period and ensure that you can document when you sent the notice. The lender is supposed to give back any fees already paid within 20 days. You may also have a right to rescind a real estate contract if you can establish that you were deceived in buying your home. This is a little tricky in Massachusetts because there are few affirmative disclosures that a seller or their agent is required to make. Sometimes it is possible to negotiate a mutual mistake basis for a rescission. You may not rescind a contract in every circumstance. 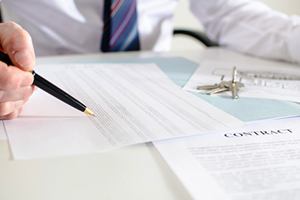 In Massachusetts, when you make an offer on a home, the offer is a contract. Not everyone realizes this. Later, the details of the transaction may be spelled out in a purchase and sale agreement. It will have the same major terms, such as the offer amount, consideration that is typically from $500-$1,000, closing, and contingencies, but it will be far more detailed. Usually, contingencies include a buyer's ability to get financing and home inspections for items like pests, radon, and mold. When you have a contingency in the contract that permits you to terminate for the reason that you want to terminate, and you are within the time period specified, there will be no issue. However, if your contingency dates have elapsed, you may be stuck. The seller will be able to keep what is in escrow. In some cases, the seller may sue you for damages, but often the contract will limit the seller to recovering only the deposit amount. If you wish to issue a rescission notice to a lender or seller, the Boston real estate lawyers at Pulgini & Norton may be able to advise you of whether this is possible and provide legal representation. We handle real estate transactions in Andover, Weymouth, and Lowell, among other Massachusetts communities. For a free consultation with a property transaction attorney, contact us online or call us at 781-843-2200.